An international project sponsored by the National Naval Museum (Paris), the Musée national des Arts et Traditions Populaires (Paris), The French Ethnology Center (National Scientific Research Center, Paris), the Center for Mediterranean Studies at Tel-Aviv University. 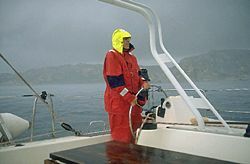 Jean Cuisenier steering the catamaran of the 1999 expedition during a gale offshore Sardinia. -finally, the results obtained must be communicated and valorized, so asto enable a full appreciation of the Mediterranean world and its ancient cultures, and of the quality of the sites to be preserved.